for a 15 year old. According to this blog the New York Times will soon start splitting it’s Children’s and Young Adult titles, among other changes. It’s an interesting move from both perspectives. The original ‘rant’ argued that children’s books should not be considered ‘young adult’ just because adults read them as children; in other words, “Nostalgia is what is going on here and it isn’t fair. That is, it is all well and good that those adults who enjoy reading young adult books today like to reminisce about their favorite teen reads. But when they include children’s books among them and call them YA, they are marginalizing the true readership of these books” (Monica Edinger). On the flip side, it’s also interesting that ‘young adult’ books are finally being recognized as a distinct and identifiable category. Now I don’t think there will be much agreement on what exactly ‘young adult’ means. Personally, I hope the disagreement remains because undefinable things are generally more interesting to talk about. A few years ago I hosted a panel at an academic conference entitled “Exploring Young Adult Literature”. In the question portion, I asked the panelists to explain how they had defined ‘YA’ for their respective papers. The range of answers were interesting and included readership, psychological and developmental stages, and publishing designations. This range of definitions lead to a great discussion that continued over lunch. The day would have been a lot less fun if there had been one definitive answer. In this blog, I unofficially use publisher’s marketing strategies as a guideline, simply because many of my teen suggestions come from the YA section of our store. Books that are placed in this section are usually culled from teen lists and teen imprints. It’s quite clear if a book is designated as YA through cover illustration, jacket description, accompanying promotional materials, not to mention the book’s price point. All of this, of course, begs the question of how a manuscript becomes designated as ‘YA’ by the publisher and acquires all of these peritextual components. Authorial intention? Previous publications? Content? A particular genre happens to be popular in other current YA fiction? Age of protagonists? Sexuality? All of these are a small list of possible contributing factors. Some contributing factors are easily understood; some seem completely mysterious. You can see why this is a really interesting topic! As for today’s recommendation, I’m going back to our picks and one of my favorite books from this year: Maggie Stiefvater’s The Raven Boys (Scholastic, $18.99). Like much of YA lit there is a tremendous amount of ambiguity in this novel. I feel like every time I try to describe it, I can’t quite find the words I need. This book eludes concrete definitions, which perhaps is precisely why it is YA lit. Gansey is on a quest. A junior at the all-boys Aglionby prep school, he surrounds himself with the friends and resources he needs to uncover an ancient legend. He’s wealthy and charismatic: a little too pompous for Blue, but she is slowly pulled into Gansey’s obsession. She has no interest in falling in love, certainly not with a Raven Boy from Aglionby Prep, but then why did Blue see Gansey walking the copse road, and what exactly connects her spirit to his? The first in a quartet, The Raven Boys blurs the lines between mysticism and realism. It’s an auspicious start to what is sure to be an excellent YA series. for a teenager, who has read everything. Yesterday kicked off Yalsa‘s Teen Read Week so I thought it would be a great time to highlight YA books. There are so many phenomenal YA writers now and I’ve really enjoyed seeing people take the genre increasingly seriously over the past few years. Did you see the NPR list from this summer? For teens who do a lot of reading, I’ll start by recommending Kerstin Geir’s Ruby Red (Henry Holt, $9.99), which is the first in a trilogy followed by Sapphire Blue and Emerald Green. The books are translated from the German and the pacing of the first volume is very different than many American YA books. The narrative is methodical — slowly establishing the character and building up the intricate context — and it incorporates time travel, secret societies, romance, and history. The hardcover flap jacket is stunning and I first picked up the book because it was so attractive. Unfortunately, the paperback cover is kind of trashy and I’m having a harder time selling it. The second volume is available this October. Ruby Red ends right when the action really started picking up and I’m anxious to read Sapphire Blue. I plan to buy it in hardcover as that paper back cover is terrible and doesn’t do justice to the quality of the story! Even teens who are widely read might have missed this highly-recommended series. Today is my final post on non-fiction for the week, and I must admit this topic was much harder than I expected, probably because I don’t read a lot of non-fiction myself. I know there are some great series out there, but I am starting to agree with the Guardian article that non-fiction just doesn’t get the attention it deserves. Today’s recommended series is thanks to a tip I received from a customer. A boy, about 11 years old, came into our store one day asking about books on physics, technology, the periodic table. I had no idea what he was talking about, but finally discovered the Basher series. The books are written by various authors but illustrated by Simon Basher (Kingfisher, $8.99). This particular young customer had bought a few of these books the day before and wanted to know what else we had from the series. I’ve never seen a kid so enthusiastic about books on grammar, music, chemistry, math, or punctuation, but as I gathered the series from around the store, he got increasingly excited and had a really hard time deciding which one to take home. I started to see the appeal. Simon Basher is an internationally recognized artist, and this series contains delightful, vibrant illustrations. Each book is narrated by relevant characters; according to the website description of Astronomy: Out of this World!, “The universe is an enormous place. Imagine it as the home of a crowd of cool cosmic characters, each with their own personality. This book is your essential guide to these out-of-this-world beings who make the universe tick.” The books are quirky, humorous, and informative and the website is engaging and interactive, with games, activities, and further information on the series’ topics. I was a little sad that the customer didn’t choose the grammar book, but his parents did remind him several times that they could come back for more books later. Mollified, he selected two: Physics and The Periodic Table. What an endorsement for this excellent series! Today’s category is rather general, because this recommended series covers a lot of topics. Turtleback Books, of HarperCollins, publishes a series of books entitled Let’s Read and Find Out – Science ($5.99), which are edited according to levels. The levels are as much about cognitive development as reading level. Level 1 includes titles such as Clouds, From Seed to Pumpkin, Fireflies in the Night, My Five Senses, What Lives in a Shell, and A Nest Full of Eggs. Level 2 contains significantly more books and is more conceptual than Level 1. 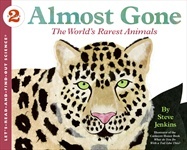 Examples of titles in Level 2 are Why Do Leaves Change Color?, Fossils: Tell of Long Ago, What Happens to Our Trash?, How Do Birds Find Their Way?, Follow the Water from Brook to Ocean, Volcanoes, How Do Apples Grow?, Forces Make Things Move, What Will the Weather Be?, and the latest title, Almost Gone: The World’s Rarest Animals.